￼we promised that Release 24 would feature a new and even more efficient way to optimize files called Consolidate Meshes. While the two methods are similar in what they achieve, consolidating meshes has a very large advantage over creating new Library Items: the size of your file does not increase. To help you use this new feature, Release 24 also offers a new Visual Style (Bounding Boxes) that enables you to easily determine which objects need to be optimized and which do not. The Consolidate Mesh feature helps increase performance in Shaded Views by enabling you to “transform” complex objects made up of multiple polygons into objects that behave as a single entity. wysiwyg, like AutoCAD and all other similar applications, handles single objects comprising many components much better than it handles each of the components separately. In other words, a file that contains twenty risers each made of six surfaces is less efficient, and thus slower, than a file that contains the same twenty risers combined into a single object. Once enabled, bounding boxes appear around all items in the Shaded view. Those objects with a high number of bounding boxes are all candidates for having their meshes consolidated. 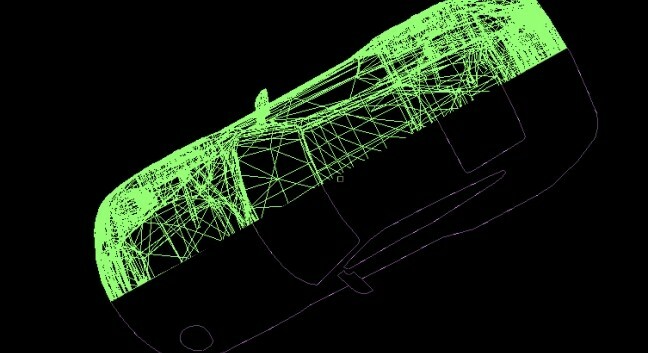 To optimize your file by consolidating meshes, it is best to work in Quad (CAD mode) because it is much easier to look at what needs to be consolidated and have the ability to select and consolidate the object(s) right away, than to flip back and forth between Shaded and Wireframe views. Once you determine which objects to consolidate, perform the procedure below. In a wireframe view, select the object that you want to consolidate. From the Tools menu, select Consolidate Mesh. Result: A message box appears, confirming that the operation is complete, and displaying the number of polygons that have been removed from the file. Click OK. The item is now consolidated into an object, which wysiwyg “sees” as a single entity. Once you have consolidated various objects in your file, you will immediately notice that the Shaded view has become faster. To test this, click and drag within the Shaded view. Another way to see the improved speed is to enable View Statistics on the View Options tab. If you do so before you start optimizing, there is a good chance that the View Complexity will read ‘High’ or ‘Very High’. Once you’ve consolidated a few objects however, not only will the View Complexity drop to ‘Medium’ or ‘Low’, but the Number of Objects will also decrease dramatically while the FPS counter will. It is important to learn to use this feature properly. Let’s take as an example a theatre that includes audience seating comprising chairs from the wysiwyg library. Since these objects are already optimized (i.e., wysiwyg sees them as single entities, not as separate components made up of armrests, backs, legs, and so on), there is, seemingly, nothing left to consolidate. However, all these seats were placed in the theatre individually, whether they were copied & pasted, arrayed, and so on. As a result, wysiwyg still considers them to be individual entities. To optimize this file, therefore, you could select all the seats (or, if more control over overall placement is required, select all the seats within a seating section) and Consolidate them into one large object. A similar example involves seats that were created in AutoCAD or SketchUp and imported into wysiwyg. In such a case it is recommended that you consolidate a single seat, copy and paste it around or array it to create the seating sections, and then consolidate the sections (or all the seating at once) to further optimize the file. If, on the other hand, the imported AutoCAD/SketchUp file contained all the seating in the theatre, I recommend consolidating the sections (or all the seating) directly, instead of consolidating individual seats. Since objects to consider for consolidation can be virtually anything, it is pointless to provide a list of what to look for. The best practice is to always turn the Bounding Box view style on once the venue/set in your file is nearing completion (and before you start defining hang structures and hanging fixtures), and then optimize as much as possible. Objects that have been modified with wysiwyg’s Boolean tools need not be consolidated since all Boolean operations perform the consolidation automatically. Objects that have been consolidated cannot have Boolean operations performed on them. This is by no means a flaw or a limitation of wysiwyg’s Boolean tools, but simply the way in which 3D models work: when an object is consolidated, its underlying geometry is modified in such a way that no further geometry changes may be performed on that object. If an object to which a texture has been applied is consolidated, the texture will most likely not behave correctly. This is, again, due to the object’s underlying geometry having been altered in such a way that it cannot support textures properly. To maintain proper texturing AND have the file perform well for pre-visualization, the only thing to do is create a copy of the final file, optimize the copy, and then use the optimized file for pre-programming purposes and the original file for screenshots and/or renderings.